Brittany Leigh is a law clerk focusing her practice in the preparation and prosecution of patent applications. Brittany began the first part of her career at Ford Motor Company where she was a member of the Ford College Graduate Program - Body Interiors, a rotational program offered to new hires, with her most notable rotation being the launch of the Ford Edge in Oakville, Ontario. Upon graduation of the program, Brittany worked as a design and release engineer, where she gained experience in interior door trim panels. She also gained design and release experience with other interior parts, such as soft trim and hard trim panels. 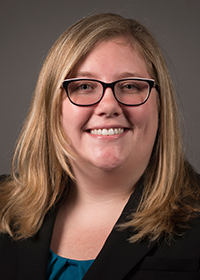 After gaining a few years of experience at Ford, Brittany decided she wanted to move her career to intellectual property law, where she enrolled at the University of Detroit Mercy School of Law. She spent the first part of school at a Michigan-based law firm, drafting and prosecuting patent applications and more recently, joined Bejin Bieneman as a Law Clerk. Brittany is currently a law student at the University of Detroit Mercy (J.D. expected in 2020). She received her Bachelor of Science in Mechanical Engineering from Purdue University in 2013.